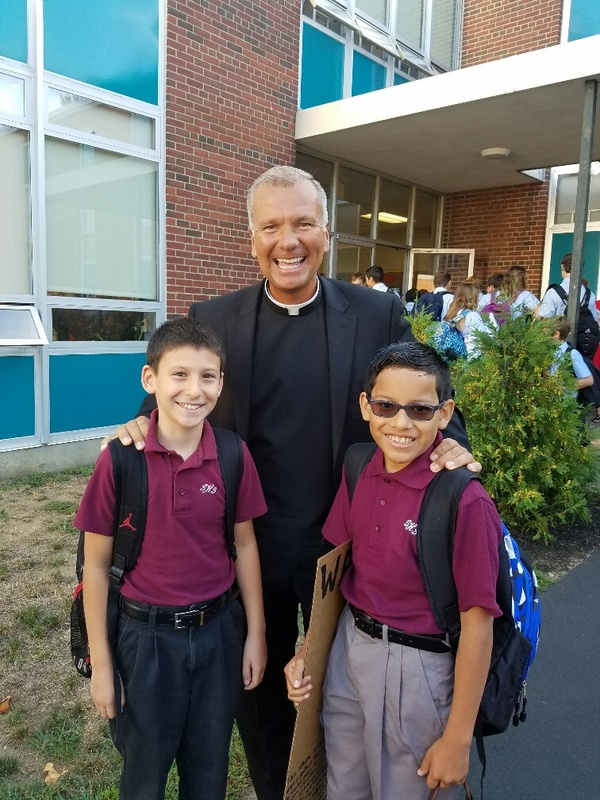 Sacred Heart School provides a faith-filled, academically excellent education for our students, and proclaims the Gospel of Jesus Christ by fostering the spiritual, intellectual, physical, and social development of our students. A welcoming Catholic community bringing faith to bear on all things where parents, faculty, and administrators are partners in creating and maintaining a collaborative and nurturing learning environment for the whole child. Sacred Heart School is the parish school of Our Lady of the Miraculous Medal Parish in Hampton, New Hampshire. It was founded in response to the expressed need of parents who wished to provide a Catholic education for their children. In 1962, the foundational cornerstone of the building was laid; in September 1963, under the leadership of pastor Msgr. Matthew Casey and principal Sr. Mary Barnea, SM, Sacred Heart opened with students in grades 4 and 5. The administration continued to add another grade each year, beginning with junior high grades, until the Grade 1 through Grade 8 was complete. The first class graduated in 1967. Sacred Heart School flourished through the 1970s, reaching an enrollment of approximately 250. In 1983, Msgr. James Watson became pastor and appointed Jeffrey Quinn principal of the school. In 1984, at the request of Principal Quinn, a Kindergarten program was established at SHS. When Fr. George Ham became pastor in 1988, he appointed Sister Mary Francena Morin, SM, principal. After Sr. Francena’s retirement in 1993, Sister Mary Joan Walsh, OLL, was appointed. In 1994, Sr. Mary Joan identified a need that was not being met in the greater community and began a full-day Kindergarten program. During this time period, a Pre-Kindergarten program was added, along with an Extended-Care program for students who needed to arrive earlier or leave later than the regular school-day hours. The current Sacred Heart School leadership team includes pastor Fr. Gary Kosmowski and principal Mrs. Teresa Morin Bailey. The time was 1606 – before the Declaration of Independence, before even the Mayflower Compact. The place was the area that would become St. Augustine, Florida. The event was the first Catholic School on our shores – begun by Franciscans to educate children in Christian doctrine, reading, and writing. For four hundred years, Catholic education has contributed to the development of individuals and society. And today, at our own Sacred Heart School, that tradition has been continued and augmented so that today’s children are educated in the best way possible. The early Catholic educators could never have envisioned the needs and demands of educating children in contemporary society, nor could they have envisioned computers and electronics that are matters taken for granted today. What the early Catholic educators gave us, however, is the call to educate our children for lives of leadership and service, to enhance their ability to solve problems and make decisions, to develop the intellectual acumen to support our democracy, to meet the demands of the time in which we live, and to preserve the commitment to the Gospel message that is the foundation for all we do. At SHS, students participate in religion classes, prayer services and attend Mass once a month. SHS welcomes children from a variety of religious and cultural backgrounds with the understanding that Catholic religion classes are part of the daily curriculum in all grades. Non-Catholic parents who want an educational curriculum coupled with a Christian ethical code and moral compass are invited to explore what SHS has to offer them and their children.